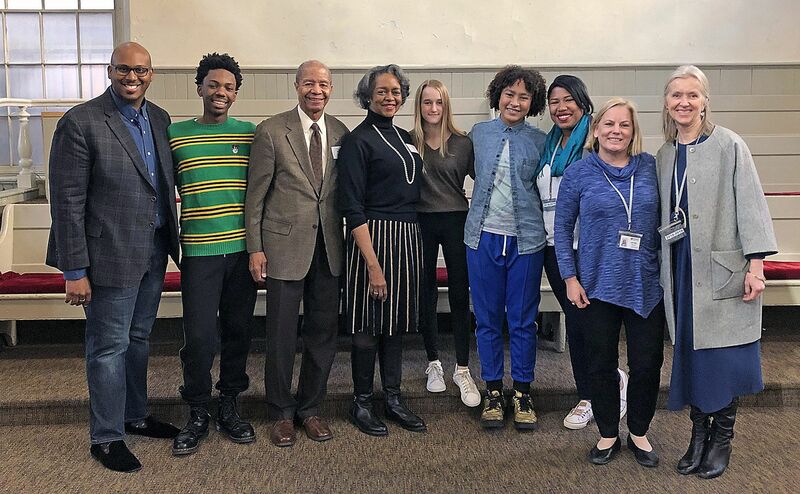 Veteran civil rights activist Nell Braxton Gibson visited the Meetinghouse on January 14, 2019 to urge Friends students to engage in something bigger than themselves. “This is a time in your lives when you can decide to make a difference in your lives,” Gibson said at an Upper School assembly in honor of the upcoming Martin Luther King, Jr. Day, “and I challenge you to do so.” Gibson, who is the mother of the late Bert Gibson III ’87, also spoke at length about the civil rights movement, its unfinished character, and what King's legacy invites us to do in the present. Tenzin '22 began the event with a rendition of “Oh Freedom!”, a spiritual anthem written after the end of slavery and popularized in the Civil Rights Movement. Sophie '22 and Bryson '21 then spoke to the recent Civil Rights-focused trip that took students on a personal journey through the South before introducing Gibson, who articulated the struggles of growing up African American in the Jim Crow era of Mississippi. She recounted two poignant stories that would later propel her to join the Civil Rights Movement of the 1960s: the first was the brutal murder of 14-year-old Emmett Till in August 1955, and the second was the heartbreaking murder three months later of a 16-year-old boy, Howard, with whom she was in love. Gibson moved on to attend Spelman College in Atlanta in the 1960s, where she walked on picket lines, participated in mass demonstrations, registered first-time Black voters, and was subsequently arrested for protesting segregated hearings at the Georgia State Capitol. She not only recounted the horrific violence of the Civil Rights Movement, but also explained that she and her peers were willing to die because their cause was so much greater than themselves. In the 1980s, Gibson focused on alleviating homelessness and assisting those living with HIV/AIDS. She later moved to South Africa where she assisted in the design of a five-year plan to help end apartheid, supported a global inter-religious justice movement, and made efforts to address racism in Christian communities. Despite Gibson’s impressive resume and track record for implementing real change both in the U.S. and abroad, she stressed that “It doesn’t take heroes to make a movement. It takes ordinary people to make a difference.” She paralleled many of her experiences to the events of today, from Black Lives Matter to March for Our Lives to Occupy Wall Street. Gibson explained that Friends is a particularly exceptional school that helps young people really comprehend what is happening in the world and prepares students for what is needed in the future, which is why she was proud to send her son here. Gibson and her husband, Bert, are the parents of the late Bert Gibson III '87. The Gibson family established the Bertram Gibson III '87 Scholarship Fund at Friends Seminary in his memory for a student in financial need who aspires to be a writer. She details her lifelong commitment to social justice and takes us into the heart of this personal history of struggle in her memoir, Too Proud to Bend: Journey of a Civil Rights Foot Soldier. On the homepage: Nell Braxton Gibson pictured among other Unsung Heroes of Civil Rights featured in the NY Daily News in 2016. Click here to read a transcript of Nell Braxton Gibson's speech in the Meetinghouse on January 14, 2019.